A-ROO Company LLC and its subsidiary operations have taken great care in preparing the content and information not only of this website but also that of all our other printed publications, brochures and product flyers, etc, and is provided “as is” and without warranty of any kind, either express or implied, including but not limited to any implied warranty of merchantability, fitness for use or for any particular purpose or in regards to non-infringement. Content and information contained on our website may contain typographical errors, it may also contain technical inaccuracies and the information may be changed, updated or modified at any time without notice. Products, Promotions and Programs presented on our website that also might be contained in our other printed publications are subject to change and modification without notice. This website contains links to other websites that are beyond our control. They are provided strictly as a matter of convenience to users of our website, however we are not responsible and accept no liability for the content or information contained on these sites. A-ROO Company and its subsidiary operations also do not endorse the information or product claims presented on these sites. We sincerely appreciate our Customer’s business, and welcome all Visitors to our website. We respect your privacy and we will do our utmost to keep all the information you provide us secure and safe. A-ROO Company LLC and its subsidiary operations are committed to keeping your personal information private and secure. We respect the privacy of all Visitors to our web site and do not provide any information obtained to any third parties. 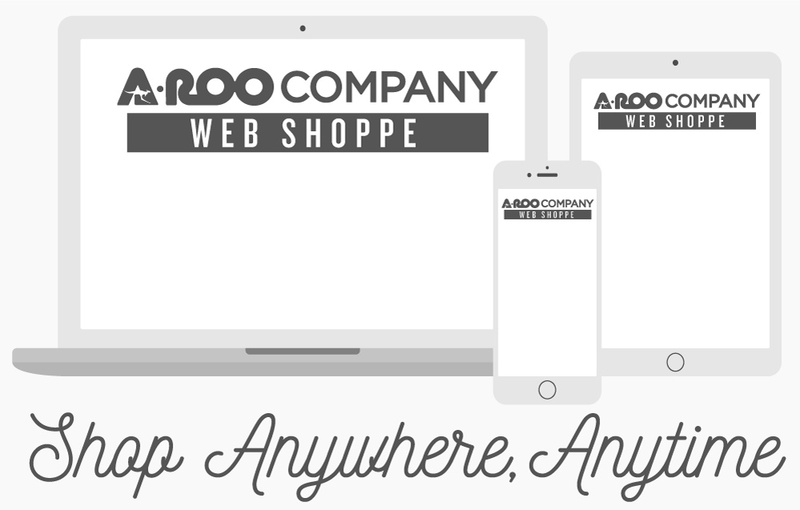 The information we receive is only used internally by A-ROO Company LLC and its wholly owned subsidiary operations. Although A-ROO Company LLC and its subsidiary operations exercise the utmost care in this regard, we cannot be held liable for the information obtained by third parties or warrant the security of any information during transmission to us, and you do so at your own risk. The transmission of data over the Internet cannot be guaranteed to be 100% secure and only you are responsible for maintaining the secrecy of your private information. Our website contains materials protected by US Copyright and Trademark laws. All product designs, art and pattern designs presented and contained on our website and all of our other printed publications are copyrights and trade products of A-ROO Company and its subsidiary operations. None of these materials may be reproduced, disseminated, distributed or used in any other way or in any works in any form or in any part without the prior and express written consent of A-ROO Company LLC. A-ROO Company LLC and its subsidiary operations reserve the right to modify this Policy of using this website at any time without notice. If you have any questions or comments about our Policy for using this website please contact us. The minimum order A-ROO will process is $75.00. This dollar amount relates only to the sales value of the goods sold. Shipping, handling and broken case charge fees are not a part of the $75 minimum. For orders below $250.00 there will be a handling charge of $25.00. For less than case quantities, a $5.00/item handling fee will be assessed. Many customers contract with A-ROO for creating concepts, logos, drawings, marketing materials, etc. A-ROO charges a fee of $75/hour for art preparation. The Creative Department can provide an hourly estimate as needed regarding the estimated time the project will take to create. Customers can expect professional quality renderings and a fast turn-around time.